Harp History and Special Tunings!!! "When in doubt, lay out...or warble." "Black music has rhythm front and center." "Play to the strengths of the instrument." Joe's primary talk for the evening was about the construction and tuning of the harmonica over the years. With this thought as his guide, "The diatonic harmonica is a wonderfully imperfect instrument", Joe displayed a variety of harmonicas that have been mechanical attempts over the years to solve the chromatic scale problem. He showed and played the slide chromatic (aka Koch Chromatic), XB40, Suzuki Overdrive and others, coming in the end to a Brendan Power tuned harmonica. Joe points out that bends on a diatonic tend to have a much stronger sound tonally and that overblows are tonally weaker. In his mind this is not, as Jerry Portnoy put it so well, playing to the strength of the instrument. Summarizing all these interesting harps, he points out that an effort to achieve missing notes with mechanical means and special tunings always has a downside, be it larger size; or that valves produce a subdued, wimpy sound; or that you lose the rich blues chords in special tunings. He is fairly impressed with the Brendan Power "powertuning" solution which gives you the 2-4 draw bending sound further up the harp, so if this interests you, order his book here: Introduction To the Power Bender. Brendan is an amazing musician and this is definitely something to check out! Chicago Blues Harp Bash Thank-You!!! YouMissedMonday missed a very important thank-you last week. We have a wonderful Chicago Blues Harp Bash website in place thanks to the efforts of Jaime Viehweg. This is a very important part of the success of our show. It lets us promote the event and shows clubs and musicians we work with that we're professional and serious about putting on a high-caliber show. Huge thanks to Jaime for maintaining the site over three years now. We couldn't do it without you Jaime, thanks! 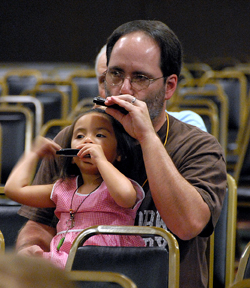 Here's Jaime at SPAH teaching his adorable daughter to blow harp! One thing I learned at SPAH is that I need to refine my practice skills. Talking with Dennis Gruenling and hearing Howard Levy speak both gave me a list of new ways to practice and it all relies on having great practice tracks. I've started using some of Dennis' new jam tracks and they're great! They are organized by key, so if you have the "Badass Harmonica Jam Tracks - Key of D" for example, it will have a dozen tracks, all in one key but with different grooves and tempos. Dennis hires different musicians to record the tracks, so they all have a little different feel. A given groove, say 12-bar shuffle, in the key of D will sound different from the 12-bar shuffle in the key of C, so switching keys gives you a distinctly different track to play over, not just a pitch change. Tracks come with a pdf showing the form of the song and some notes from Dennis about how to navigate the form - a great way to learn to better follow the chord changes. Dennis is a skilled harmonica instructor and it shows in the thought and care he's put into compiling these tracks. All files are available as downloads or on CD at Badassharmonica.com and Dennis is adding more all the time. He tells me there are sophisticated, non-twelve-bar forms coming too! Get yours now and improve your practice time. Tell him B1 sent ya! Our thoughts go out to harp player Little Sammy Davis who suffered a stroke recently. Get well soon!